Mermaid vibes. Hand drawn inspiration quote about summer with mermaid`s tail. Typography design for print, poster, invitation, t-shirt. Vector illustration isolated on white background. Mermaid vibes, vector illustration with mermaid tail. Mermaid word with splash. Cute handwritten text and drops graphic print for tee, shirt, poster. Vector illustration. 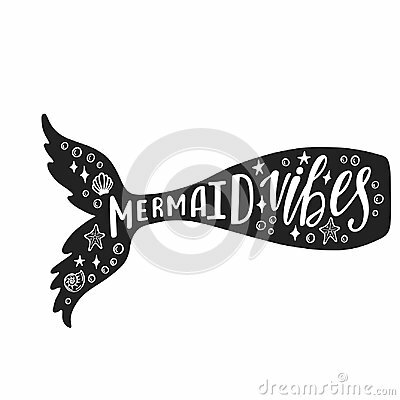 Salt water vibes - funny typography with mermaid with fish tail. Mermaid vibes hand drawn vector lettering.